The TCI Discussion Board is a transcription forum where professional transcriptionists and translators can interact with each other. The team at the Transcription Certification Institute (TCI) has been committed to training transcriptionists for over a decade. TCI has provided thousands with transcription skills that have made them leaders in the industry, and this success led to the birth of the TCI Discussion Board. What better way for these professionals and beginners to interact with each other than through an online forum? If you are a newbie in the transcription field, this is the transcription forum for you. Join the TCI discussion forum to network and get to the next level in your career. Through the board, you will gain knowledge, get free mentorship, and access helpful resources. You will also learn how to improve your transcribing skills by avoiding the common pitfalls beginners experience as they start out. For those looking for transcribing jobs then this is the platform to build relationships that may see you get your first gig. Professional transcriptionists and translators working in the legal or general medical field will also find valuable and relevant information in this forum. In the forum, there is information on transcription resources and new tools that will help you solve daunting problems. You will end up working faster and better from using ideas shared by industry elites in this forum. The TCI Discussion Board follows the basic guidelines of most online forums; be respectful, be engaging, be active, provide value. Before posting, you should first search your question in the forum just in case a similar question had been answered before. This way, you will benefit from the answers given by your peers. From there, you can ask other questions or follow up with something that was not addressed in the response. Read the guidelines at https://forum.transcriptioncertificationinstitute.org/guidelines for more information or get additional help at https://forum.transcriptioncertificationinstitute.org/help. 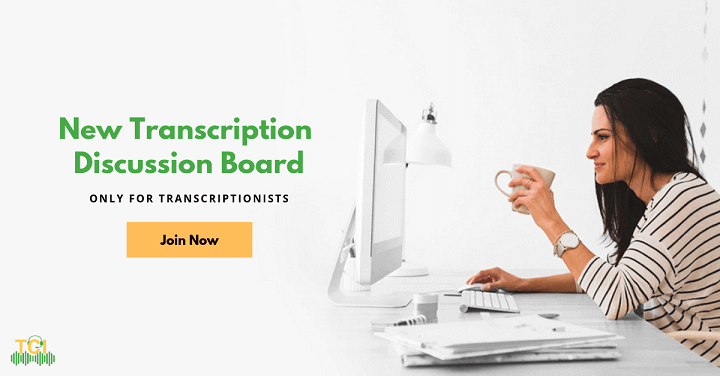 Sign-up for a free account at the TCI’s transcription discussion board today. This is the most helpful transcription community on the internet.